Some people think I’m crazy because I love to move furniture. I’m not talking about carrying heavy loads in and out of trucks or up and down flights of stairs. I’m talking about moving furniture that’s already inside a home but doesn’t look right or feel right because it’s in the wrong spot. Why a piece of furniture isn’t working starts with the expectation that we know how the insides of our homes should look. We figure that since it’s our home and our stuff and we’ve brought them together, we ought’a be able to arrange everything the way we like because after all, it’s our stuff, we picked it out and we love it, right? So what’s the problem? Why isn’t it working? And since we’re talking about our stuff, maybe it never really did work together to begin with. And maybe we’ve got some stuff in the mix that we really don’t like or maybe we really hate it, now that you mention it, right? That’s how my story started; with my husband’s parent’s furniture filling up our house in an arrangement I came up with that not only didn’t work, it made me feel uncomfortable and worse, vulnerable. 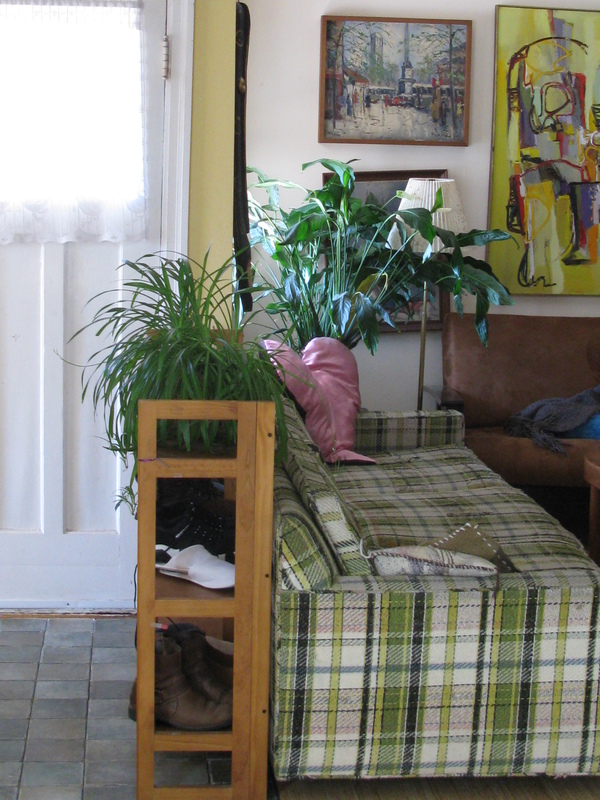 The arrangement included a large sofa against the wall opposite the front door. I didn’t mind it being there until my son was born and every time I sat on the couch with my baby in my arms staring at that front door, I felt anxious, nervous and uncomfortable. I intuitively knew that in the unlikely event an intruder should suddenly burst in, my son and I were vulnerable as we were be the first target for whatever deed, intended or not, that they had come to accomplish. So I started moving my furniture around. 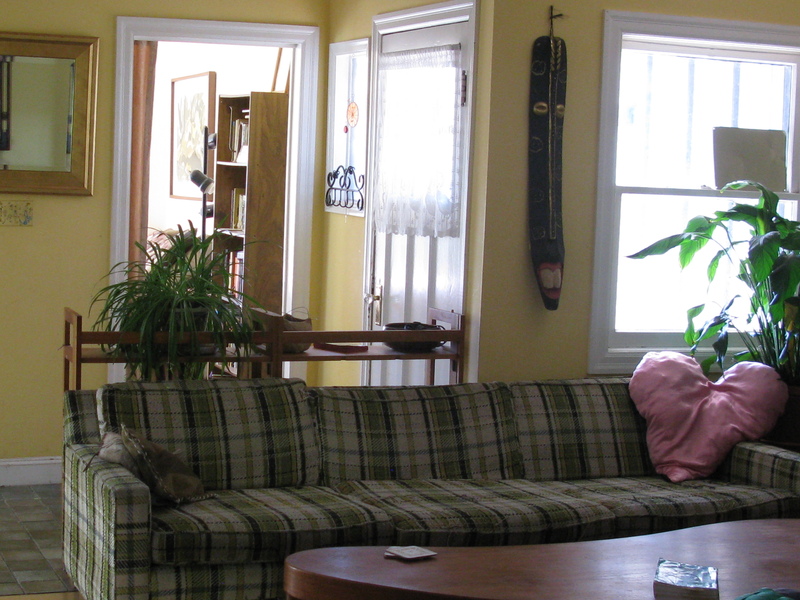 Super long couch creates a physical barrier to the front door. 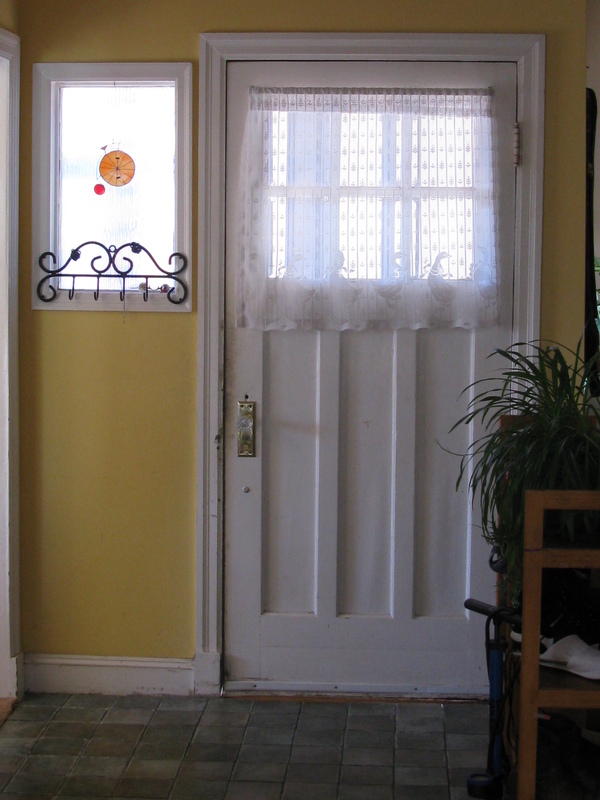 Front door with tile to create a foyer where none existed previously. Shoe shelf behind the couch offers added protection and a convenient place to put shoes. 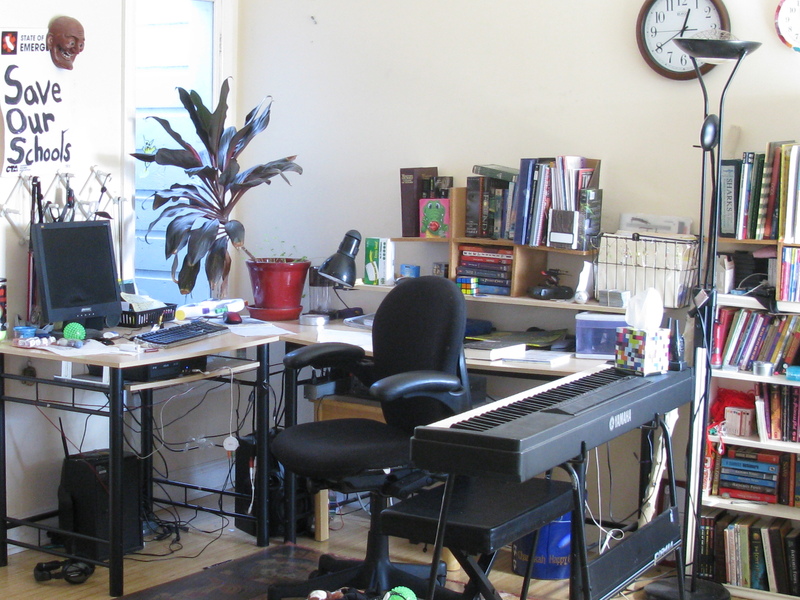 A workstation now occupies the wall that faced the door. Second work station along wall opposite door. I must have moved the pieces a hundred different ways before I figured out (in a dream no less) how to make it all work. Later on, my dad and I created a foyer with tiles to give the illusion of an entryway that protected myself and my guests from unexpected visitors. I added a shoe shelf barrier in front of the backside of the couch that conveniently hid the ugly backside and provided additional storage for shoes. 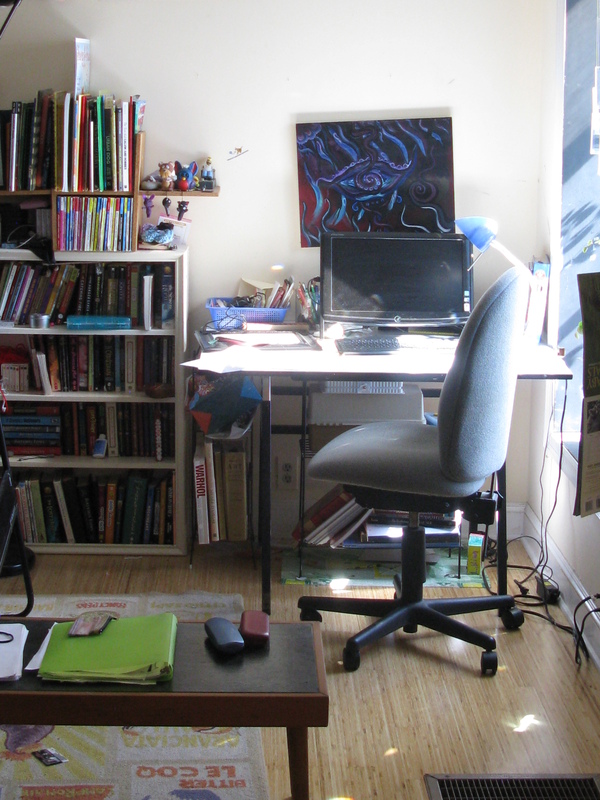 I’ve since added another child into my family so now, where the couch once was, is a study area for two kids to work. This experience showed me in a mental and physical way that the placement of furniture can have a positive or negative effect on one’s comfort level inside the home and, just as importantly, I realized that moving furniture, paying attention to the chi, life force that surrounds us everywhere, is what I wanted to do and learn more about. So I enrolled in the American Feng Shui Institute and became a certified consultant. It’s a little ironic that as a kid, I always liked to move my bed around and try new arrangements. Every time I rearranged things, the energy in the room got so stirred up I could feel the change inside my body; the air felt different and the lighting changed. It’s funny how I forgot about all of that and now that I’ve rediscovered it, it’s as though practicing feng shui and doing room arrangements is what I was always meant to do. Now I want to share my knowledge, experience and enthusiasm with others. Recently, I posted my credentials and reviews on Thumbtack.com and have been hired to do a couple of home arrangements for clients. The work has pushed me into new areas and forced me to better understand what I do best, what I want to do and what I don’t what to do. What I do best is listen to what my clients want in any given room in their house. I like to hear them tell me what’s working, what isn’t and why, if they know. What I want to do is help them create a home that they love, is highly functional and inspires them to discover their own creative spirit. What I don’t want to do is encourage consumerism. I’m a heavy weight believer in using what my clients already own to realize the dreams they have for their homes or offices. I’m an interior decorator with what clients have. They just might not see their potential because things have a way and getting placed in the wrong room or being hidden by a mass of other stuff. My favorite part of my work is hearing my clients tell me how they never would have thought of doing what I did and how much they love the change. So now I need to do something that terrifies me, something I’m terrible at doing, marketing myself. 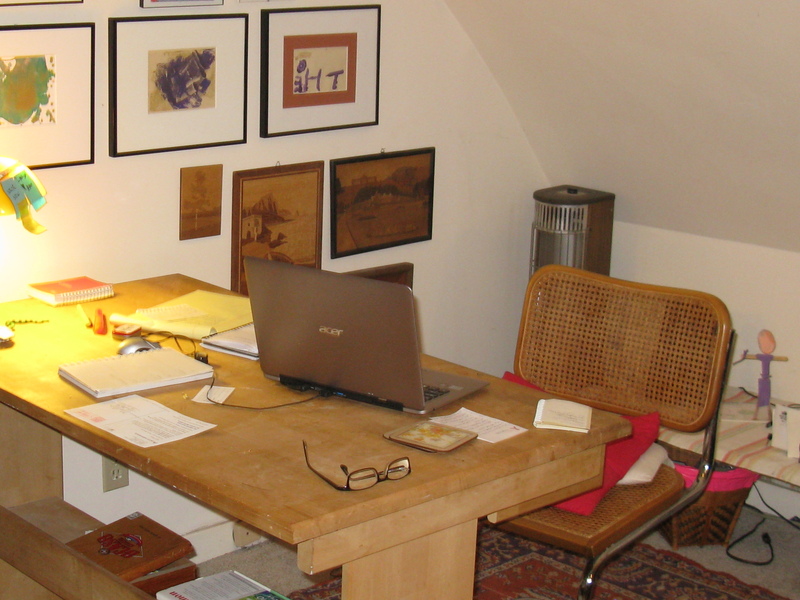 I don’t have a lot of clients, yet, and I love doing this work, so I’m going to market myself here, as practice, to show you what I’ve done in my home and to see what, if anything happens. Attractive, meaningful clutter gives me a sense of purpose. Unattractive clutter with useless, homeless items creates a sense of chaos and confusion. This is my office. It’s cluttered but I really like the look of the books mixed with personal effects, photos of family, my Egyptian statue and Venus Di Milos that I picked up in Greece. The overall impression I get when I walk into this space is that I read alot, I’m busy and I’ve got a life. However, I’ve been feeling really stuck lately, like I’ve fallen into any empty well and can’t get out or accomplish anything worthwhile. I decided it was time to stir up the chi and see if anything happens. 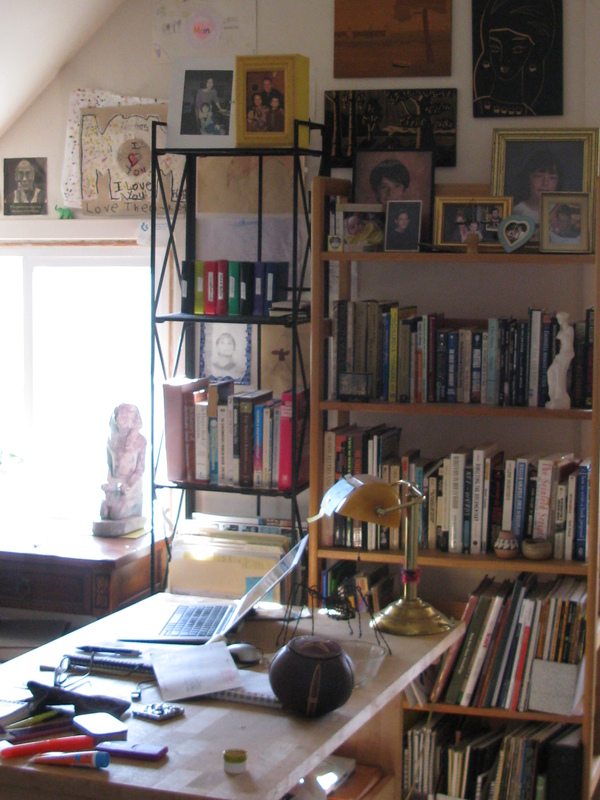 In my current arrangement, my desk faces west and the book shelves are lined up against a south wall along with my Egyptian sculpture on a wooden console. I figured the sculpture likes being in the sun so I wanted to keep it there somehow. I also wanted to add a “money” plant in that sunny spot. A money plant is any kind of green, smooth, round leafed plant, typically a jade plant, that adds the spirit of money to an office. Left, is a picture of a table behind my desk where I tend to put stuff I don’t know where else to put including speakers and a turntable that I no longer use (it’s for sale if anyone is interested). The roof here is extremely pitched so any attempt to stand up from a chair or futon (unseen in these pictures) will result in a bruised head. I spent a day rearranging some of the furniture. I turned a futon whose back was against a northern wall 180 degrees so that it faced the wall and had its back to the south. I kept my desk facing west but pushed it against the north wall. 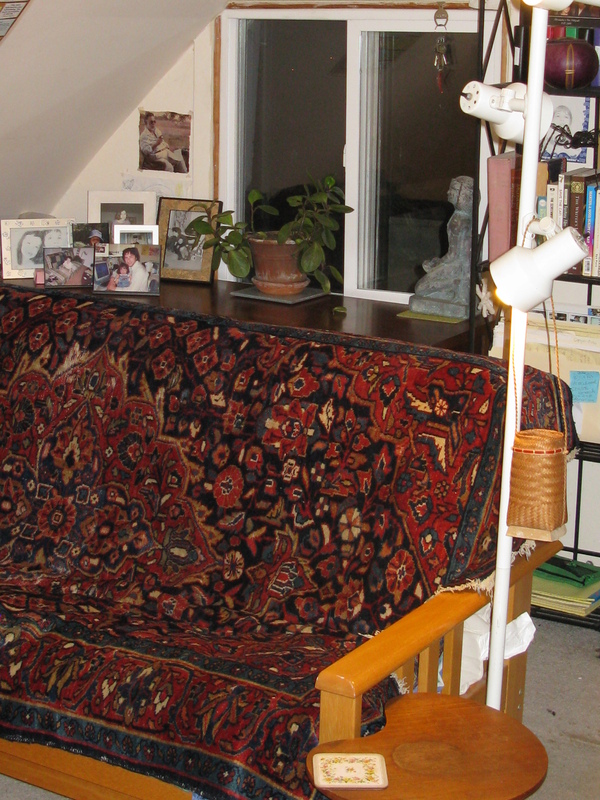 The futon with a Russian rug as a cover, faces the desk and the wall where it used to be. I found a new home for the turntable and moved the table with the the speakers north so it’s still behind my desk but less cluttered with stuff I don’t need. 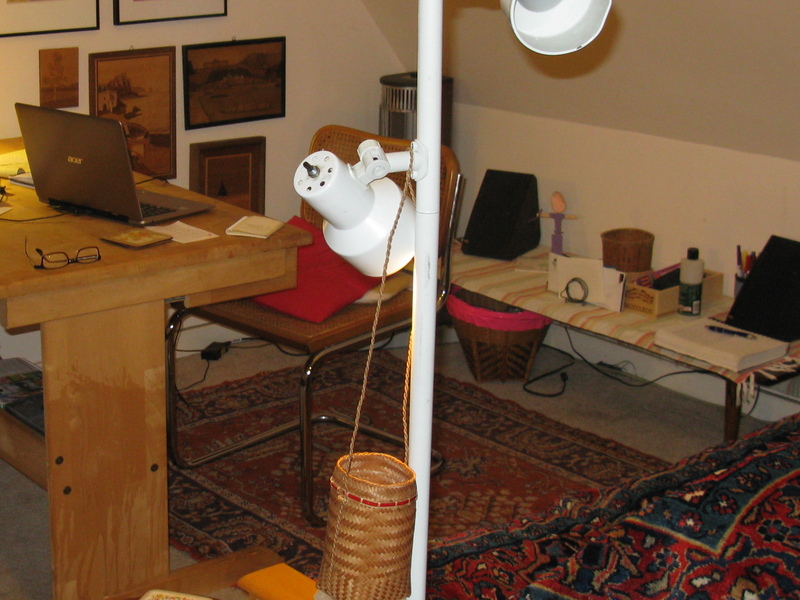 Basically, I moved three objects yet I completely changed the look and feel of the room. 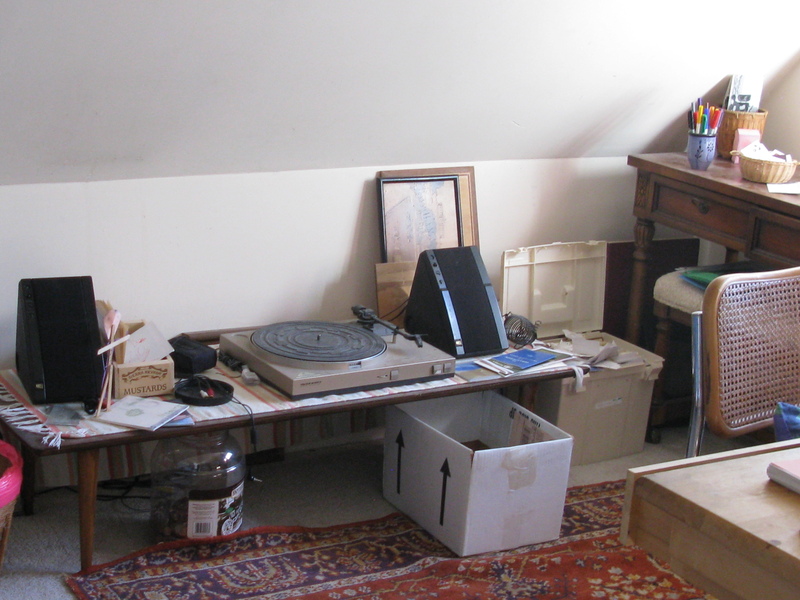 The small table still houses important items but isn’t nearly so cluttered. So, tell me what you think of all this and if you’re interested in my work and live in San Francisco, email me. Like I said, I love doing this work; its what I do best and nothing makes me happier than making my clients happy in their homes. This entry was posted in Uncategorized and tagged clients, comfortable, console table, Egyptian sculpture, feng shui, happy, money plant, room arrangement, safe, safety, san francisco. Bookmark the permalink. …..I sleep best in a freshly cleaned and ClutterFree room… curious is it the the work or the Result…The Result that gives me the Peace and Quiet. it is pretty cool to have questions answered in your dreams. I too live and sleep better in less clutter. For me, because I love to rearrange space, the work and the results give me pleasure. Thanks, Steve, for being a #1 viewer.